Caucasus International University (A League) agreed terms with 22-year old American point guard Andre Walker (185-79kg-96, college: Loyola, MD, agency: Interperformances). 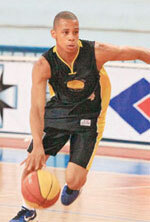 He just played at Pato Basquete in Brazilian Liga Ouro. The list of the past achievements is quite long as among others Walker was voted All-Patriot League 1st Team in 2017 and 2018 at his college time. Walker graduated from Loyola College in 2018 and it is his first season as a professional player. On Walker: Solid tools for a point guard prospect at 6'2, with a 6' 6.5 wingspan, especially when coupled with his explosiveness. -Quick twitch athlete with excellent burst. Dynamic in transition. Shifts gears with force. Doesn't need a ball screen to get to the rim. Explosive leaper in space, especially off two feet. -Game is predicated on his ability to get into the teeth of the defense. Most comfortable attacking to his Right. Plays off of hang dribbles. Can finish with either hand. -Improving shooter, although very consistent. Went through competitive shooting workouts after every session. Hard worker. Best in mid-range spots. Can create space off the bounce. -Tough player who plays with a chip on his shoulder. Doesn't shy away from contact at all. Crazed look in his eyes during the heat of the battle. Positive emotion after big plays. Keeps coming at you. Killer mentality. Attacks his own misses. -Competes defensively. Can really sit down and slide. Active hands. Not afraid to defend with physicality. -Although more of a score-first point guard, he showcased his vision throughout Hoop Summit practices and games. Can deliver the ball from different angles. Passes over the top in pick and roll with his left hand. Good in drive and dish situations. Still developing as a pure point guard but certainly has vision. -Has the mental makeup of a player who will maximize his potential.